China's Great Proletarian Cultural Revolution lasted from 1966 to 1976, and resulted in turmoil and upheaval for millions of its citizens. 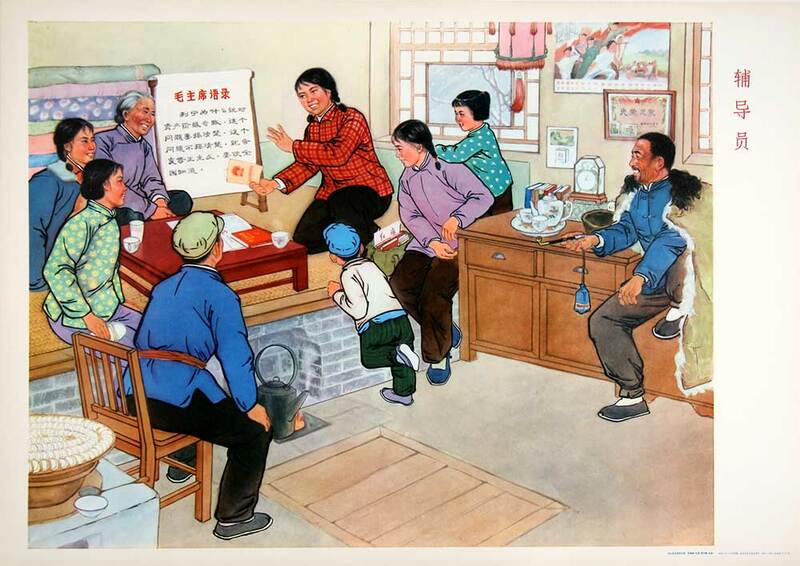 The Chinese Communist Party enforced sweeping social changes across most parts of daily life, and used propaganda posters to explain and promote them. 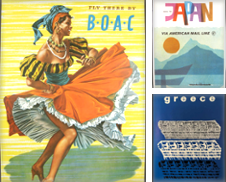 The posters have several reoccurring themes, including nature and the government's ability to tame and transform it, advancement through industrial production and mechanization, positioning women as key figures in the cultural revolution (or showing how "women hold up half the sky" as Mao put it), individuals collectively serving the people, and the guiding hand of Communist political theory running through everything. Chairman Mao was a central figure in numerous posters, literally. He is nearly always positioned in the middle of group scenes, whether teaching, chatting or leading. Although China has a long history of art, the Communists rejected this legacy and western styles, and also art for art's sake. Artists who created art to be simply beautiful were marginalized. Untrained artists were sought from the working classes. The result was a new regulated style of art where a red tractor, a red armband, or a political slogan was never far away, where fields were brilliantly green, where peasants, soldiers and city workers shared common joys, where there was always a message and where smiling faces were universal. 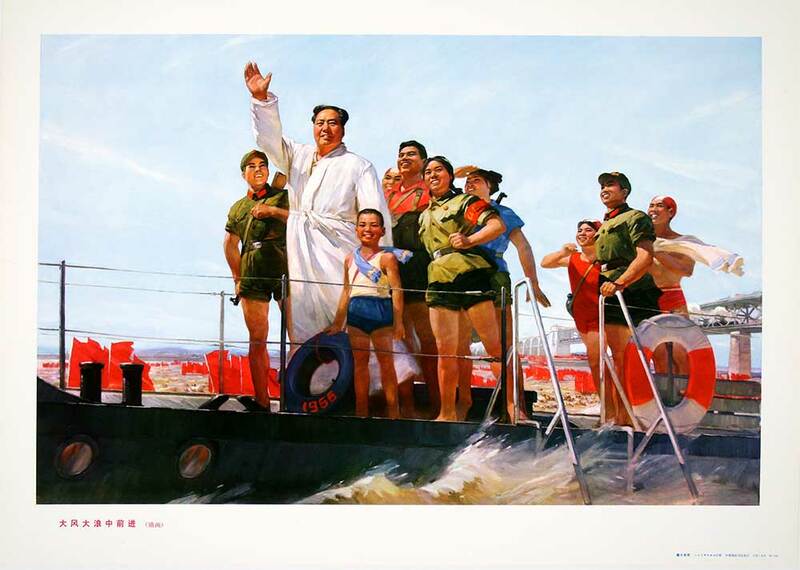 Strive Forward in Wind and Tides: Chairman Mao, in a white gown, waves from a boat on the Yangtze River with the Nanjing Yangtze Bridge in the background. 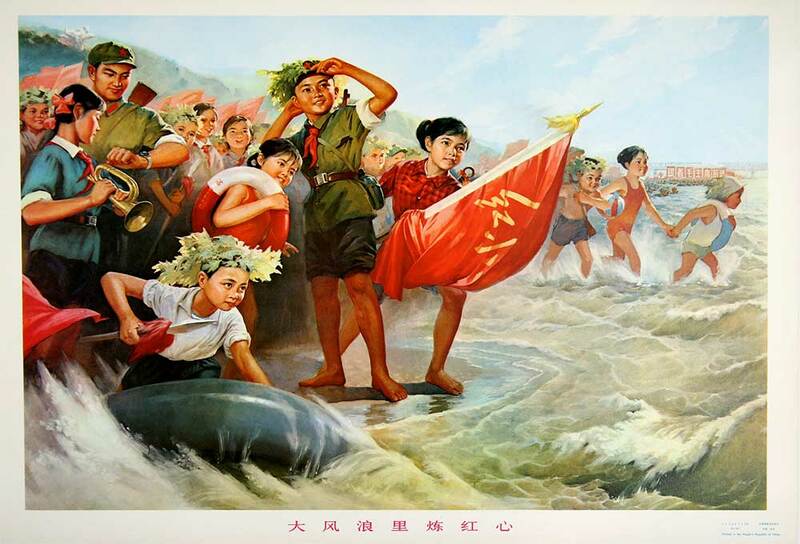 A reproduction of a 1971 painting by Tang Xiaohe, this poster salutes Mao's swim across the Yangtze in 1966 when the 73-year-old "proved" to doubters that he was still strong enough to lead the country. 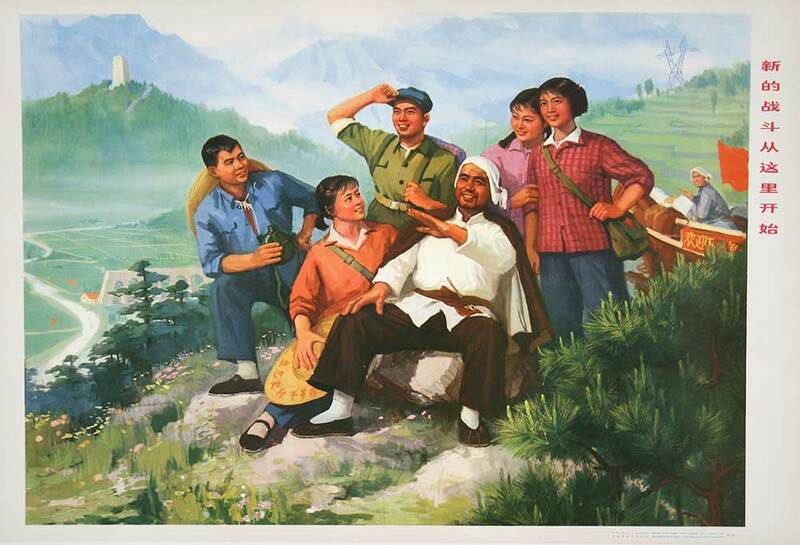 Tang Xiaohe based his painting on a well-known propaganda photograph. Tempering Red Hearts in Stormy Waves: PLA soldiers and Little Red Guards crowd onto a riverbank in homage to Mao's historic publicity stunt of swimming across the Yangtze. The Chinese text in the background reads "Follow Chairman Mao's Lead." The poster's title comes from the lyrics of a famous Cultural Revolution anthem, "Battle Song of the Red Guards." The New look of Dazhai: Dazhai is a village that featured in a directive from Mao as a model for agricultural production in the 1960s and 1970s. An example of nature being controlled via terraced fields and red tractors. Text on the billboards (left to right) reads "self-reliance", "new Dazhai" and "work hard." Mao Visits Fushun: Mao Zedong visited this open pit coal mine at Fushun in 1958. 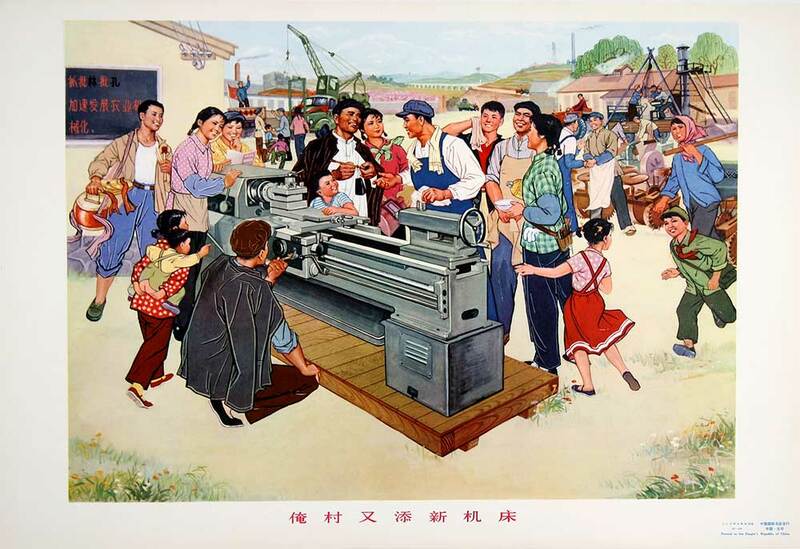 Surrounded by smiling, well-built but oddly clean coalminers, Mao dominates the poster. An example of China mastering the natural elements. 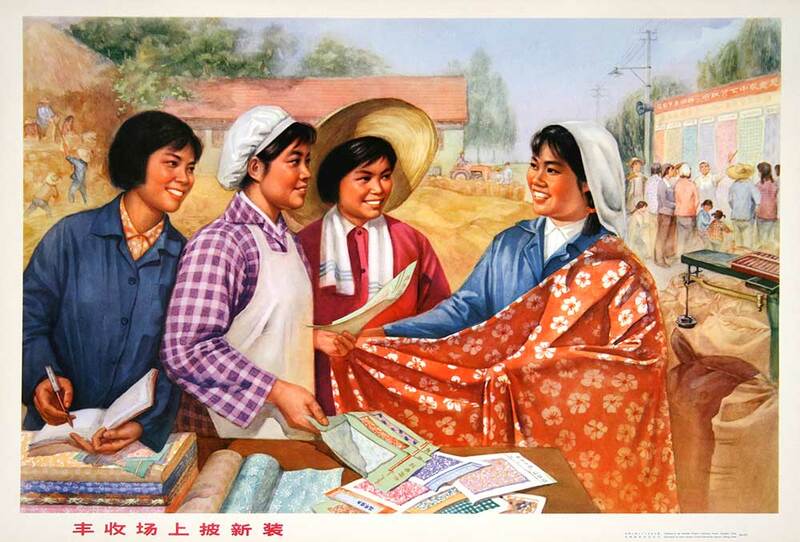 New Clothes at a Bumper Harvest Market: Four women are happily viewing new swatches and rolls of fabric. In the background peasants are offloading grain while a female worker in a white apron explains some posters to a group of people. There's even a tractor in the background. A poster of industry and contentment. A Counsellor Teaches: A young female counsellor teaches the Constitution of the People's Republic of China (the booklet on her hand) and Mao's Quotations (on a large piece of paper next to her) to villagers. A propaganda poster hangs on the wall. Mao's quotation translates as, "Why did Lenin speak of exercising dictatorship over the bourgeoisie? It is essential to get this question clear. Lack of clarity on this question will lead to revisionism. This should be made known to the whole nation." 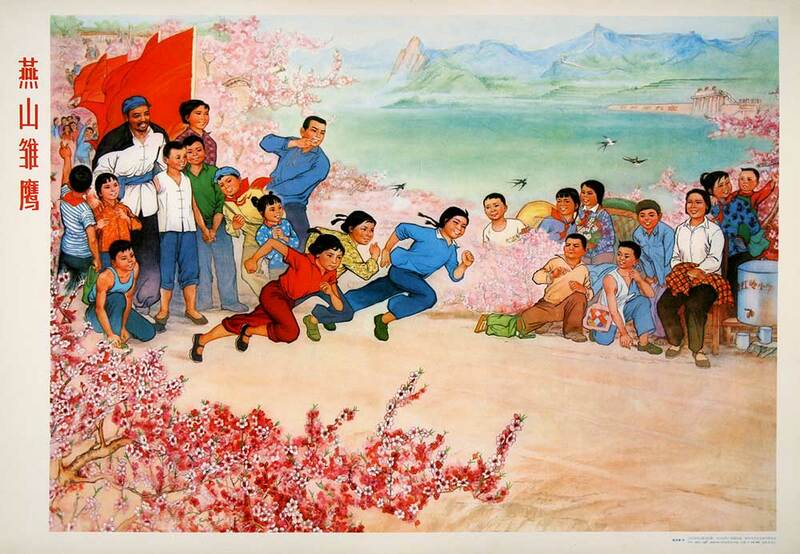 Growing up by the Side of Chairman Mao: A poster reproduced from an oil painting. 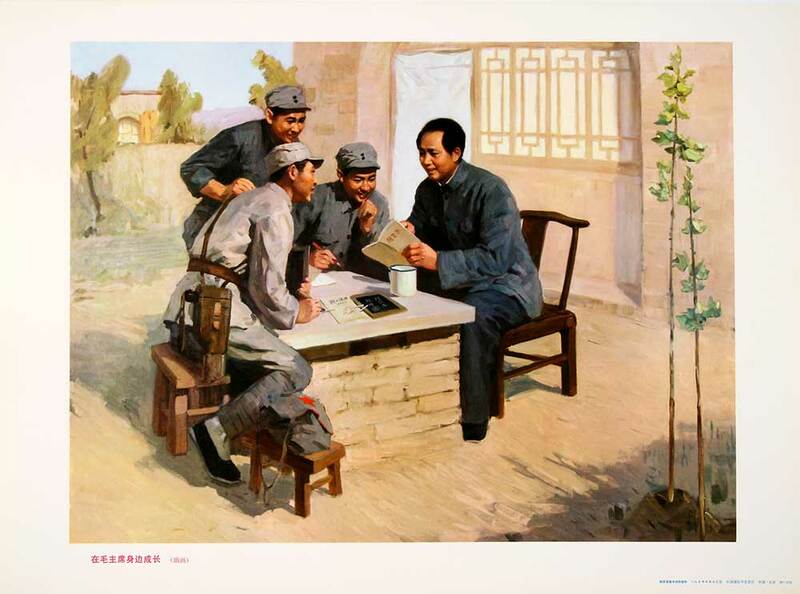 Three soldiers around a brick table listen while Mao teaches at Yan'an Revolutionary Base Area during the late 1930s. The text on the blackboard reads "To fight against Japan / To save China." Japan and China were at war from 1937 to 1945. 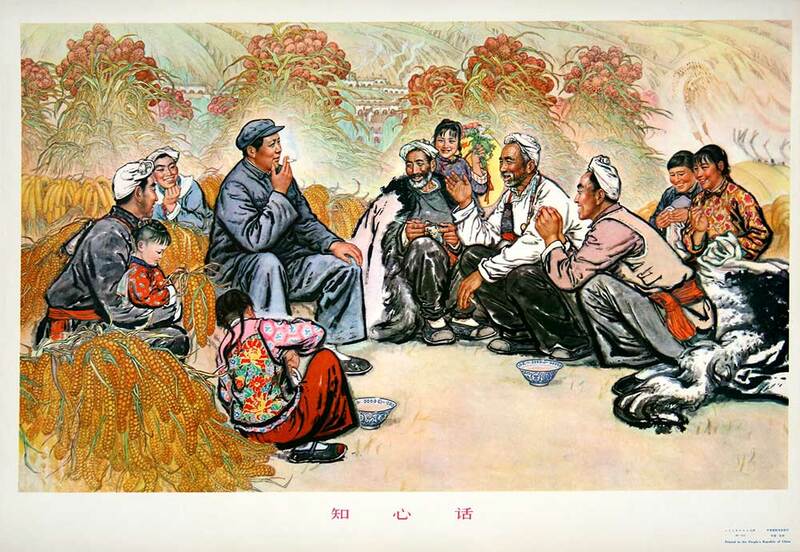 Heart to Heart Talk: A poster reproduced from a painting by Liu Wenxi. Mao chats with peasants. The goal of the image is to make China's leader appear humble and in tune with ordinary citizens. Kind Guidance: A poster reproduced from an oil painting by three Chinese artists Huang Naiyuan, Wang Laixin and Fang Etai. 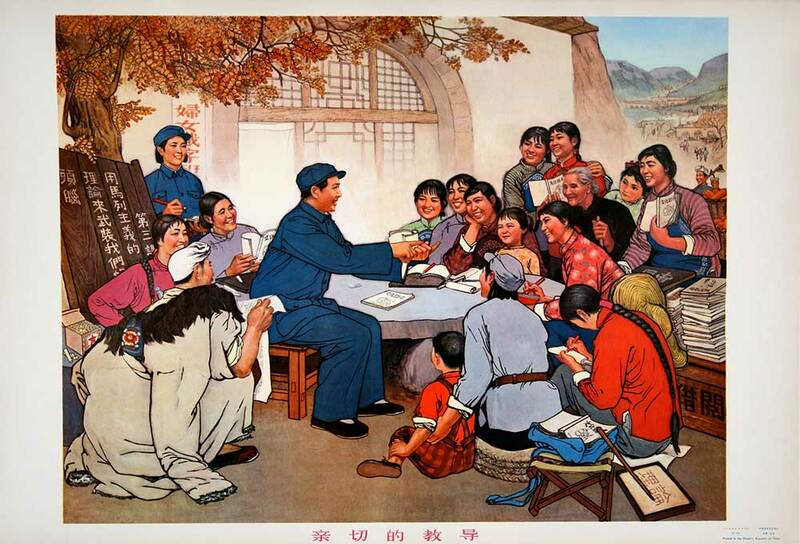 It shows Mao Zedong giving a lesson to a group of peasants (mainly women and children). The study of political theory was heavily promoted. 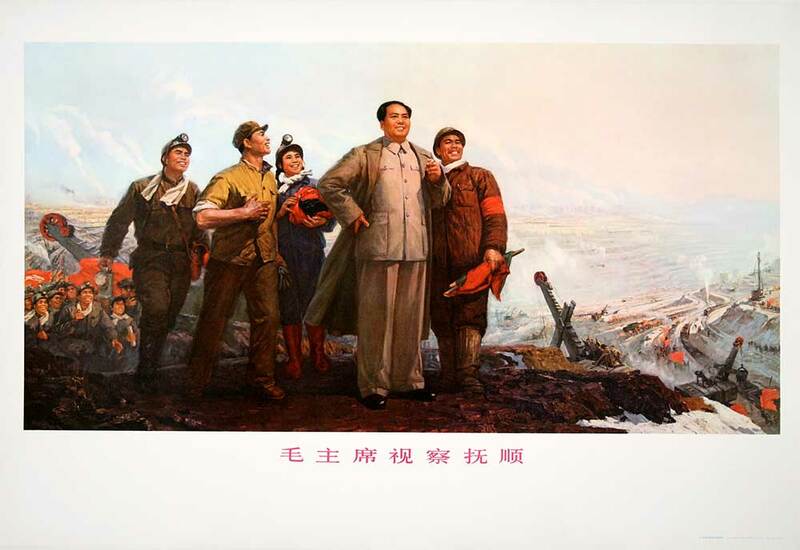 Chairman Mao and the Great Production Movement: A poster reproduced from an oil painting by artists Zhang Zini and Cai Liang. 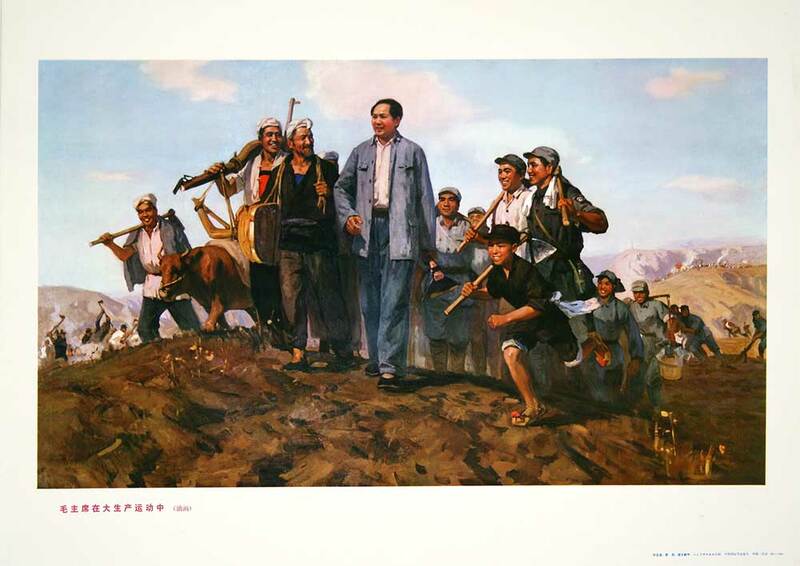 The image portrays Mao leading a group of peasants and soldiers in a field with tools at the ready. Mao initiated the Great Production Movement in 1939 with the goal to make China self-sufficient. Millions starved during a huge famine between 1959 and 1961. 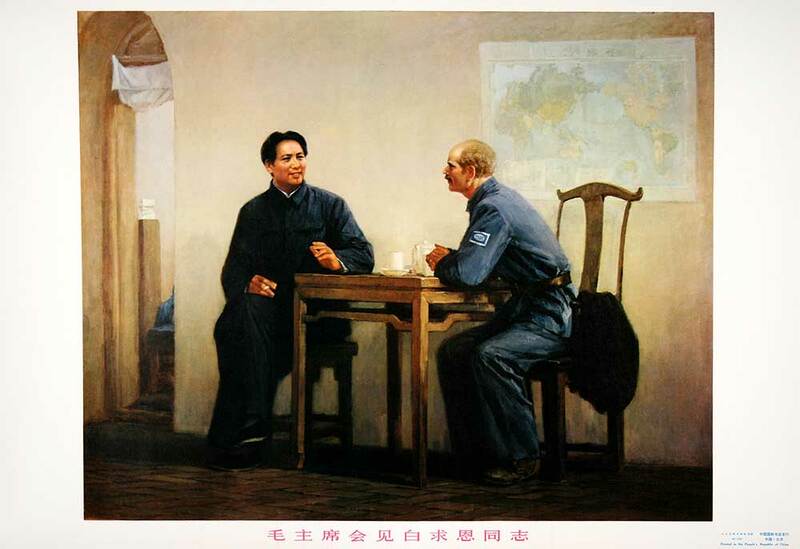 Mao meets Comrade Bethune: Norman Bethune was a Canadian doctor who became a hero to the Chinese communists for his selflessness and sacrifice. A pioneering medic and long-time communist, Bethune travelled to China in 1938 and soon become a medical advisor in the war against Japan. 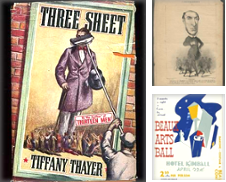 He became infected while performing emergency surgery and died in 1939. There are many statues of Bethune across China. 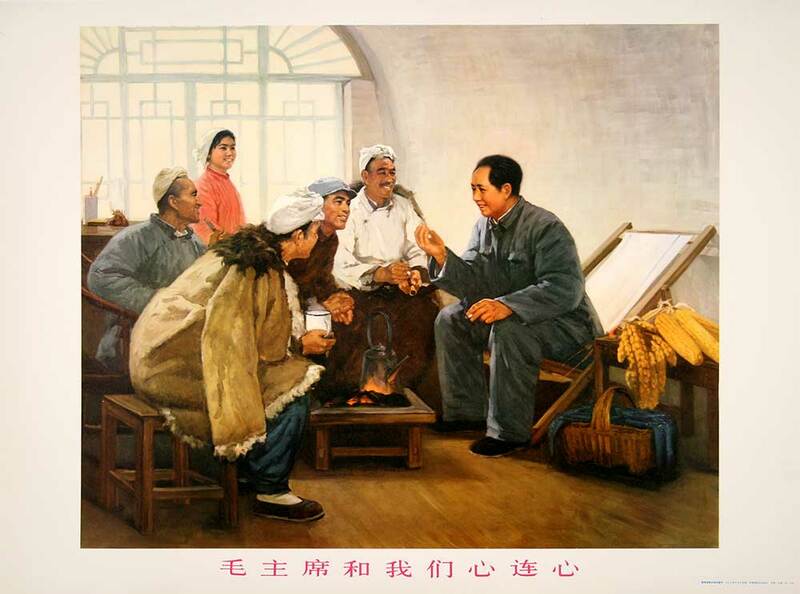 Mao's Heart to Heart with Us: Mao Zedong chats warmly with peasants in a Yaodong, that's a house cave and a typical dwelling in the Huangtu Plateau of northern China. Another example of Mao rubbing shoulders with ordinary people. 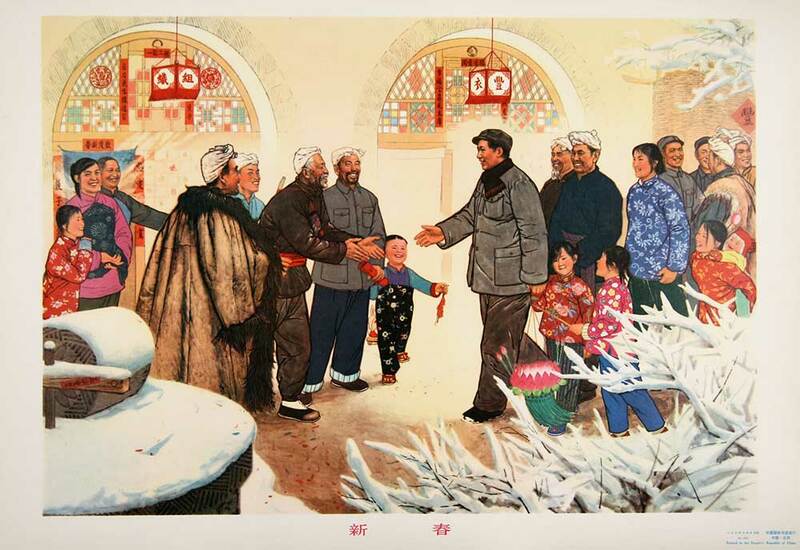 A New Spring: Ever the man of the people, Mao Zedong visits a villagers' home during the Chinese Spring Festival. The New Struggle Starts Here: The Great Leap Forward included a program of "sent-down youth" where millions of young educated people were displaced to rural areas to be re-educated by peasants. This poster shows five such youths gathered around a peasant. A red propaganda banner hangs at the side of a carriage and proclaims "Welcome Down to the Countryside Sent-down Youth". A female holds a straw hat on which is written "To be Determined in the Countryside and Make Revolution". 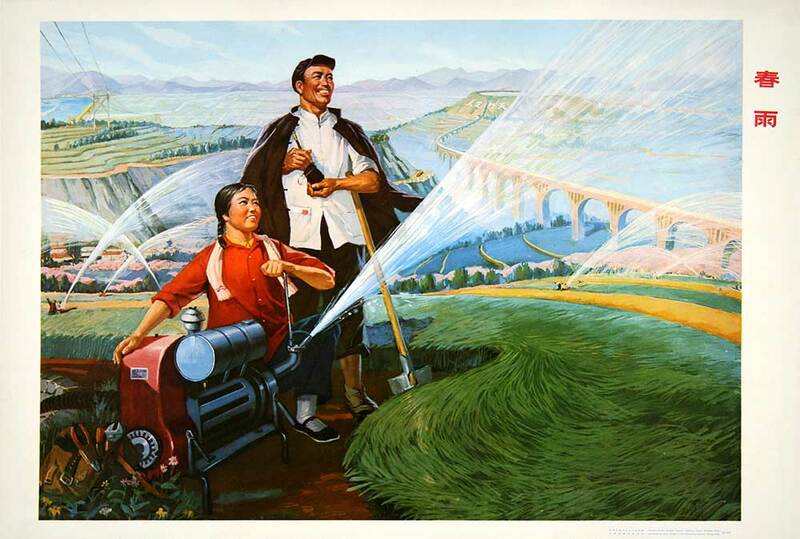 This poster was designed to recruit more people to China's agricultural efforts. Open-door Schooling is Good: Open-door schooling was a political movement that encouraged students to learn skills in a professional environment rather than the classroom. In this poster, four young people learn to use surveying instruments, while, behind them, a group of people march forward carrying tools. In the far background, a factory and construction can be seen. Sowing Trial: An image of agricultural harmony featuring yet another red tractor. Spring Rain: A female peasant operates a water pump surrounded by abundant crops. A bridge or a viaduct stretches through the fields. A classic poster showing China in control of nature and set to provide for its citizens. On the mountain side, the slogan "Man can Conquer Nature" can just be seen. 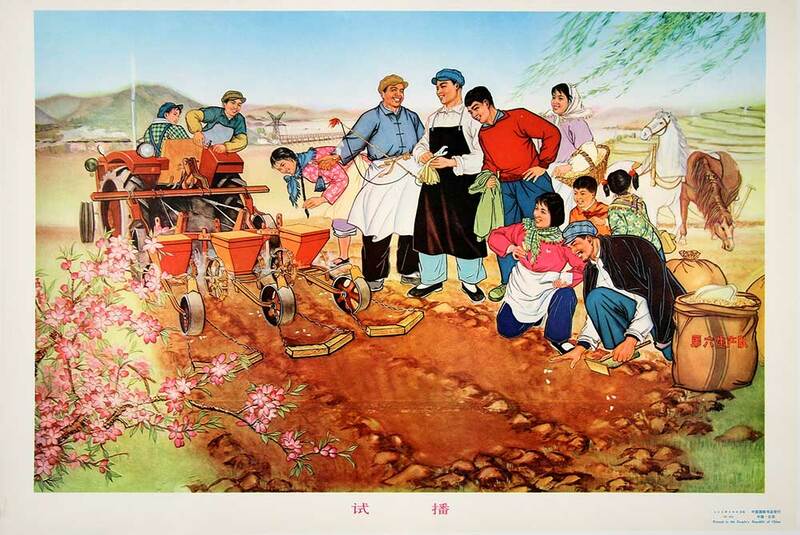 Workers and Peasants Welcome Spring as One Family: A reproduction from a painting by Fu Qiong and Feng Jianxin. 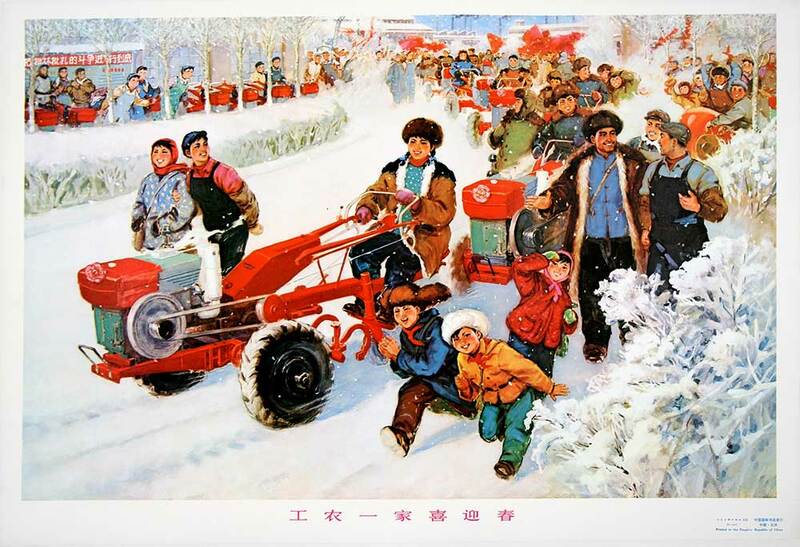 It portrays a parade to celebrate the new year, with many peasants driving decorated red tractors. Jubilant crowds, made up mainly of workers, cheer. Our Village Gets a New Machine Tool Again: An almost comical poster showing people crowding around a machine tool in a state of excitement. A block of text on the blackboard reads, "To criticise Lin and to criticise Confucius. To accelerate the development of the mechanised agriculture." In 1973, Mao and his wife Jiang Qing started a campaign called "Criticise Lin, Criticise Confucius" in an attempt to attack Lin Biao (the former premier), and promote the interpretation of history according to Mao's theories. Young Eagles on Mount Yan: A rural village scene where three primary school girls race on a dirt road while more children wait behind. Text on left margin reads "Young eagles on Mount Yan", making an analogy between the children and young eagles. Blossom and mountains make this an eye-catching poster. 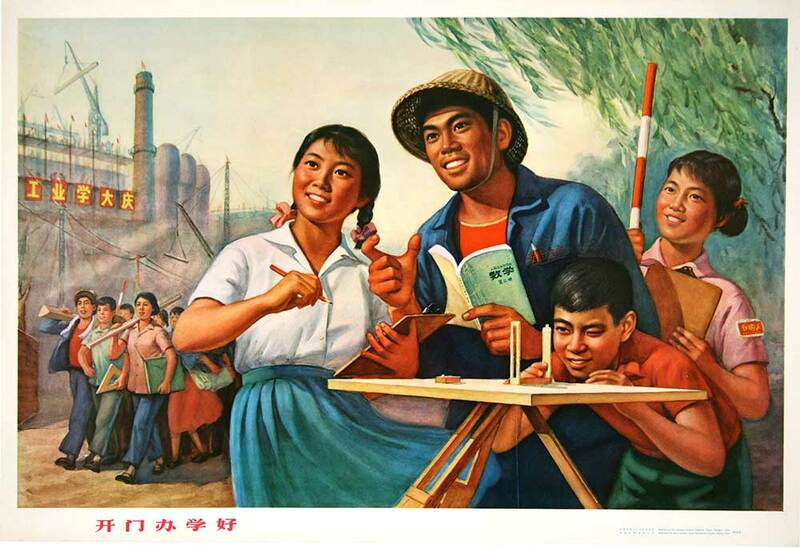 The visual aspect of Chinese propaganda was vital as many citizens could not read when the Cultural Revolution began. 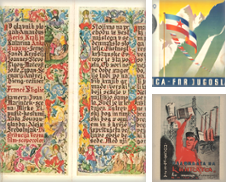 Most posters were created through a specialized propaganda department of the Communist party but units of Red Guards, acting independently, also produced their own imagery. 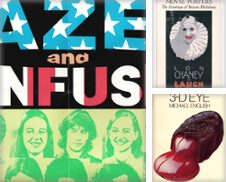 The government-produced posters was printed in large quantities and available for purchase in a government run bookstore chain. Can propaganda ever be considered as art?